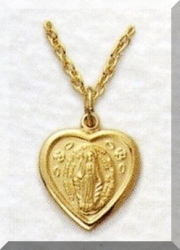 This small gold miraculous medal is heart-shaped and 14K gold filled. This beautiful medal has the image of Mary etched in the center. This Catholic medal is a nice size for children, especially for First Communion.